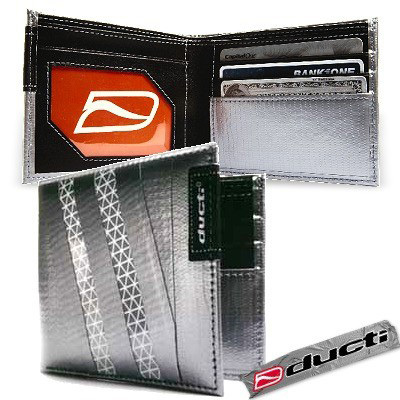 The Ducti Hybrid Bi-Fold Wallet utilizes a unique combination of 100% Super Duct Tape exterior with a PVC stitched faux leather interior and stylish stripes on the front exterior. Abundance of interior space with two separate roomy lengthwise bill compartments, three (3) credit card slots, vinyl ID/picture window, cash slip pockets on both sides, with our Ducti repair strip included! Thin design allow easy carrying in any pocket or purse, essential for your daily needs with a slight cool factor. Personalize this hybrid model by ordering striped skins in either blue, black, red, yellow, glow-in-the-dark, or reflective. Keep It Together with the lifetime trade in policy & strive for perfection!